Both the gorgeous tibouchina urvilleana and the velvety-leaved grandifolia are landscape show-stoppers for their luscious purple flowers. Though the bloom color is similar, these two mid-size varieties have distinctly different looks. Urvilleana's large blooms are made up of five wide open petals, on slightly downy, elliptical leaves. 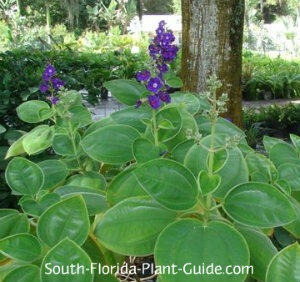 Grandifolia's leaves are rounded and so velvety soft you'll want to pet them, and the flowers are spiky upright clusters of small blossoms. These plants are so breathtaking you can expect passersby to come knocking at your door. They'll want to discover the plant's name and admire it more closely. Normally seen in shrub form, urvilleana can be grown as a small standard (tree-form). Buy it already trained this way...doing it yourself may not give you the results you want. Like most varieties of this wonderful plant, these shrubs prefer a bit of shade (like morning sun only or dappled light is ideal) rather than full-out blazing sun all day. They will grow in sunnier spots, however...if you plan to plant in a fairly sunny area, ask in the nursery in what light their plants were grown so yours doesn't suffer from a sudden sunburn. Plants that blossom in shadier areas are harder to find, and these unusual shrubs with purple flowers are some of the showiest shrubs for shade. All tibouchinas flower on and off all year - more during warmer weather. Other varieties include a dwarf shrub and a stunning tree. 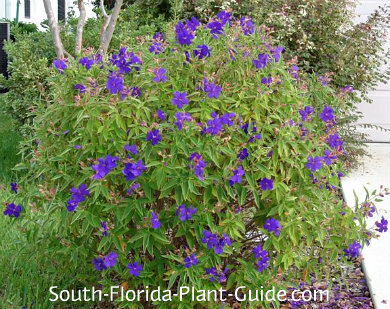 Tibouchina urvilleana and the lesser-known grandifolia are evergreen but tend to thin a bit in winter. Both do well in a part shade area. Each is a moderate grower that can be kept 3 to 5 feet tall. Zone 10 is best for the large-leaf variety. Urvilleana is more cold-tolerant, and can be grown in Zone 9B. There it will usually sustain some winter damage but generally comes back in spring. For best results, place these shrubs in an area protected from strong winds...and under a canopy of trees or other frost protected spots if you can. Add top soil (or organic peat moss) mixed with composted cow manure to the hole when you plant. Trim lightly as needed for shape. You can do a harder pruning in spring (late March or early April) for size and to promote full-to-the-ground growth. Spaced well and kept properly trimmed, both shrubs stay lush and full to the ground. 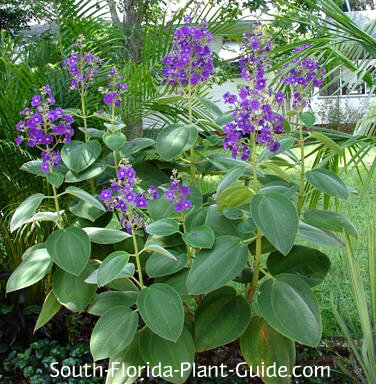 Grandifolia has a tendency to lose bottom leaves and become leggy if it's planted closely with things that prevent enough light from reaching its base. But the pale beige wood of the stems can be attractive - or you can leave it surrounded with smaller plants that camouflage the base. Fertilize 3 times a year - spring, summer and autumn - with a good granular fertilizer. You might want to supplement feedings with liquid fertilizer and/or bonemeal to encourage more flowering. Place 3 feet apart. Come away from the house 3 feet. If you're planting along a walk or drive, come in 3 feet. These plants will do fine in containers. Urvilleana: Princess Flower, Glory Bush. COMPANION PLANT SUGGESTIONS: Orange bird of paradise, cat palm, variegated ginger, liriope, false aralia, elephant ears, peace lily, pinwheel jasmine, foxtail fern and chenille plant.